The sprightly Durga Arya's Kathak performance under the aegis of Kathakonnect, an organization run by Vibha Ramaswamy, was punctuated with ebullience and joy. 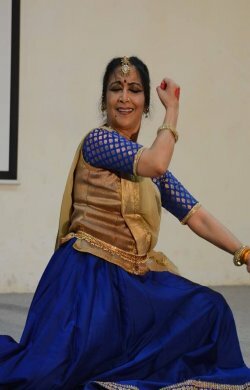 Her first footprint in Bangalore left an indelible impression on the Kathak enthusiasts gathered on April 1st at the Ginserv auditorium to witness her performance. She was introduced to the Lucknow Gharana of Kathak at a tender age under the tutelage of Guru Reba Vidyarthi. She later continued her training under Guru Munna Shukla and blossomed under the guidance of the legendary Pandit Birju Maharaj, with whom she travelled all over the world winning many accolades. She is presently settled in Germany and continuing her practice driven by a passion that marks her as a dancer of artistic accomplishment. Her opening number "Shiva Vandana" sung by Kavitha Krishnamurthy showed the consummate skill of the artist in executing the various bodily postures representing the image of Lord Shiva that carried the mark of serenity and devotion. The music composition of Bikram Ghosh provided imaginative and innovative exploration by Durga bringing into play virtuosity of footwork, effortless chakkars, dexterity of body movements, rhythm and grace expressing the vocabulary and the purity of the technique and rasa which she attributes to the Lucknow Gharana. The Thumri "Ched Chad" composed by Pt.Birju Maharaj performed by her personified visual poetry, a lilt in her smooth gliding motions that had subtle flourishes, imaginative and innovative. Her emotive expressions befitting the mood and tenor of the composition were well appreciated by the audience. The Padant that followed without any music, demonstrated the beautiful bhav with the audience actively participating in the bols. Her performance was interspersed with an insight into her "riyaz"under the legendary Pandit Birju Maharaj. The long hours of arduous practice, sometimes repetitive, honed her skills to perfection. She explained the subtle nuances of bhava. How a hand gesture can define a plea, a dominant note, and one of empathic emphasis. Regarding the chakkars one must begin with a focal point in front and after completing one must return to the focal point with proper alignment of the feet. The freezing of the sam was a sculptural delight and executed with meticulous perfection mesmerising the audience. Her guru's diktat was that one must feel the bhav inside before it can be expressed outside. In conclusion, she remarked that she dropped out of school to pursue dance but at the present time, education is a must and all dancers should strive to educate themselves. Durga Arya's performance spoke of class and aesthetics of the grandeur of Kathak and in a short space of time, she enthralled the audience with her presence.